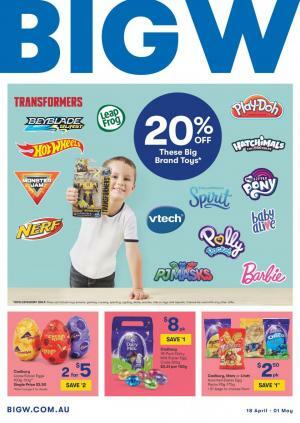 Big W Catalogue 18 Apr – 1 May 2019 deals and promotions are available right now. You can follow our Facebook page to track the deals from the future Big W Catalogues. See all Big W Catalogue products with current prices on the preview page. Big W retails baby products, clothing items, home products, electronics, toys. Big W online catalogues are also providing special product ranges like Big W toy sale. This is one of the biggest toy sale catalogues in Australia. Generall,y June-July is the time when toy sale catalogues are popular at most. The 1964 Denim Company denim jeans, jackets, casual clothing, and price drops on activewear are the main things to see the apparel range of the latest Big W Catalogue. Tees, shorts, cargo shorts, cardigan, pants, and more are in this category. 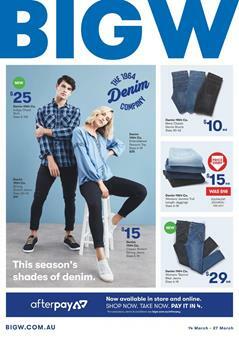 Big W sells brilliant basics products on pg 4. The store also offers free delivery when you spend $50 on all clothing, footwear. The deals is valid online-only. Avella clothing products are also on sale. Find exclusive low prices of Big W. Long sleeve tees will be only $8 this week at Big W stores. Bonds underwear consisting of new products and new prices on pg 6&7. Shop low price range for Brilliant basics stretch briefs, bras, and more in the underwear shelf. The catalogue is a good source of deals and price drops on kids' clothing. Sportive apparels for boys and girls are gonna be available for the prices on pg 10-11. There you will find B Collection and Denim 1964 Co. products. Season changes and new needs of shoes might come up in your daily life. Brilliant Basics boots are simple, minimalist, good looking shoes for Autumn and Winter. See the new boots and classic shoes on pg 12-13. Shop for your home, too. Household products, snacks, novels, bedding essentials, personal care electronics, cosmetics, makeup, beauty products are also in this catalogue. You will also find smartphones and LED Smart TVs on pg 29. Buy a TV on a budget on Big W Catalogue. EKO 31.5" TV is only $189! Subscribe to Big W Catalogue to get these posts in your email. Alternatively, follow our Facebook page to get them on your feed. Toys are wonderful things and they are the best friend of a child whose mind is full of dreams all the time. Making a scene with characters that have already background stories is a great activity that kids enjoy every day. The most popular characters and starships from movies are usually the toys to encounter in a toy sale catalogue like Big W. Jurrasic World, Hot Wheels, Millenium Falcon toys are on sale this week. Save on LEGO Sets, PJ Masks, Barbie dolls on pg 4-5. New toys are also available in the toy category of the catalogue. Shop Twisty petz 4-pack babies, Pj Masks transforming headquarter that are two new toys. Follow the Facebook page or subscribe to Big W Catalogue to get these updates on your feed and email. Sunbeam kettle, coffee machine, 4-slice long shot toaster, and more Sunbeam kitchen appliances are available at lower prices on this Big W Catalogue. Renew your kitchen or add something to your kitchen from the Big W range. All Sunbeam appliances will be 20% cheaper this week. Make your coffee with Sunbeam espresso machine and renew your bedroom with the prices from this catalogue. Jaspa pillow range will be also on sale. Save 40% on these pillows. House & Home wool quilt is a warm product for Autumn nights. Make it a safe and warm sleeping with high-quality bedding products. Price drop on Brilliant basics and plastic coat hangers on pg 3. Buy ironing boards for only $69! Save $20 on this product. Exclusive low prices of Big W on like-class products are also on the same page. Monopoly Fortnite is one of the most interesting things I have seen in a month. This game is available at Big W for only $39. Experience Monopoly with Fortnite theme and characters. Play with your best friends. Revolutionary online games like Fortnite have an impact on all toy lovers and kids love to have Fortnite toys. Figures, plush toys, and more Fortnite toys are available on pg 18. Great deals are also available. For example, Fortnite solo figure will cost only $20 at Big W this week. Moreover, you can find Treasure X chest, Really Rad Robots, How To Train Your Dragon toys on the same page. LEGO City sets will be on sale until 13 Mar according to this catalogue. Check out pg 19 for the LEGO City sets. Also, you can see the new LEGO Ninjago sets on pg 19. Poopsie, LOL Surprise!, Polly Pocket, LEGO Disney toys are available on pg 20 with new items. Additionally, this catalogue can show you the current prices and deals on books, office electronics, LED TVs, recent movies, video games and consoles, smartphones etc. New products are available in the latest Big W Catalogue. Solda Press Co is a vegan-friendly, no-preservative and no-artificial colouring beverage which is new at Big W Stores. Pay half to buy the SodaStream refreshing beverage. More soda packs like Kirks, Frantelle, Coca-Cola, and the deals on snacks like Skittles, Lindt will be on sale. Check out the price drop on Cadbury dairy milk and Allen's chocolate bags on pg 15. NEW products are not the only things you should be aware of. Take care of your skin with the best prices by Big W catalogue. Autumn and Winter may require seasonal makeup, skin-care and similar personal care items. Big W sells some good products at lower prices this week. 40% off Schwarzkopf, Garnier, and more brands. Also, see the 30% discount on Lynx toiletries, Oral-B, and feminine care products. The catalogue also offers toy sale. Fortnite, Monopoly, LEGO, LOL Surprise! and more products are available in the latest catalogue of the retailer.